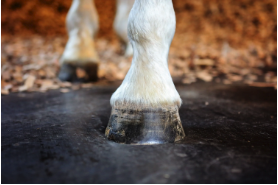 Improved joint health, improved respiratory health, elimination of hock sores, improved quality of rest, relief from the symptoms of laminitis, reduced need for stall bandaging, thermal insulation, less bedding (some claiming as much as 75% less), less cleaning time, and no floor maintenance required. ComfortStall’s Flooring System is sealed and impermeable, preventing the build up of urea and ammonia off-gasing; not to mention the significant reduction in stable dust. The design of our stable flooring uses a combination of a soft foam underlayer and a sealed rubber membrane, which not only provides superb comfort for your horse, but also has better thermal insulation compared to traditional stable flooring. This greatly reduces the need for bedding to keep your horse comfortable and warm. In fact the savings mean a payback on your investment typically in less than one year! 1,000 horses a year at Cornell University Veterinary Hospital, one of the top 3 veterinarian hospitals in USA, recover from surgery on a ComfortStall®. Today at Cornell University Veterinary Hospital’s Surgery and Anaesthesia Department, up to six horses a day undergo surgery, and afterward, every horse recovers on ComfortStall® flooring. A thousand horses a year would test the capabilities of any stall flooring, especially in a veterinary hospital environment where the strictest biosecurity measures include sterilizing flooring and walls with caustic ingredients between every equine occupant. 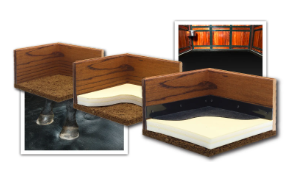 “It’s like sleeping on a mattress, but softer.” Deeridge Farms Stable Manager Carly Kaber shares her experience with the ComfortStall orthopedic flooring system. Deeridge Farm is a custom built show ground in the heart of North American equestrian sport, Wellington, Florida. Deeridge host the Palm Beach Masters, one of only seven North American, east coast qualifiers for the Longines FEI World CupTM, as well as the Deeridge Derby, the highest level of hunter competition. Prices start from $1290 + delivery. Contact us today for a quote!